It’s almost funny that the so-called Intelligence Community Assessment (January 6, 2017, Assessing Russian Activities and Intentions in Recent US Elections) claimed that the Russian interference had been against Hillary and in favor of Trump, although most of the evidence in it demonstrated the opposite. RT (Russia Today TV) and IRA (Internet Research Agency, a “troll farm” in Saint Petersburg) agitated in favor of Hillary and the policies of the Democratic Party, and against Trump and the policies of the Republican Party. The Nation is far from being pro-Trump. I think it might be called an Old New Left. This is what it says on the subject, with the links to the RT footage. The following are long quotes from The Nation. The problem with the claim that RT America is pro-Trump is that it is simply false. Many of the channel’s biggest names were either ardently anti-Trump or highly skeptical of what a Trump presidency might mean for America. Stalwart liberal Thom Hartmann, who hosts The Big Picture, has aired programs with names like: “Dictator Trump Threatens Free Speech,” “Why Trump’s Cabinet Is a Basket of Deplorables,” “How Trump Could Bring on the Crash of 2016,” “Does Trump Mean the End of the Internet as We Know It?,” “Why Trump’s Win Is a Koch Coup Against Our Democracy” and “Is Donald Trump the Master of BS?”—to name a few. RT America has also critically covered Trump’s plans to “load up Guantánamo” with “bad dudes,” run negative segments on his personal taxes, reported on Latinos fearing deportation of friends and family, criticized his joke about assassinating Hillary Clinton, covered controversy around his choice of Steve Bannon as chief strategist, and ran segments calling both his health-care and foreign-policy plans lacking in detail. “Instead of demonstrating conclusive links between the government of Russia and the hackers or between the government of Russia and Wikileaks, we are provided with a series of undocumented, evidence-free assertions of “high confidence” that Vladimir Putin directed an influence campaign to discredit Hillary Clinton in order to hurt her chances at the polls in November. RT preferred Bernie to Hillary, but when Bernie accepted the primaries defeat and endorsed Hillary, RT broadcasted his support to Hillary, and aided Hillary against Trump in other ways. 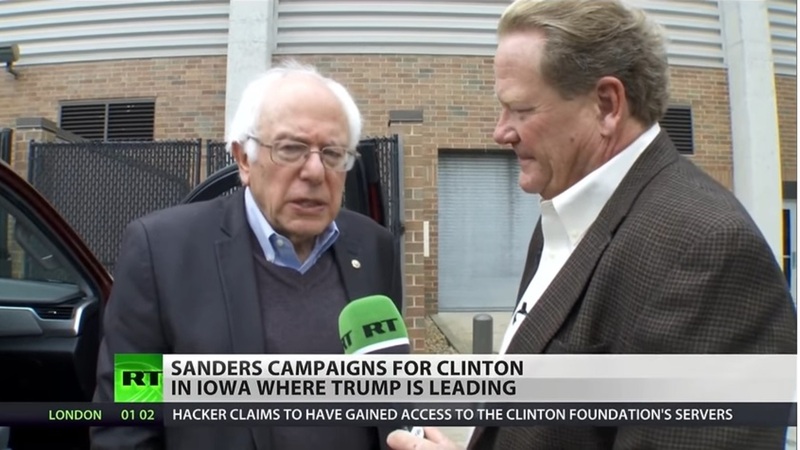 In the following frame, RT’s Ed Shultz helps Bernie to deliver his endorsement of Hillary. The following videos are posted on the RT Facebook page (might require FB login). RT also posted ‘never Hillary or Trump’ (1, 2) and more nuanced videos (3). Of course, the MSM has misreported the Assessment. 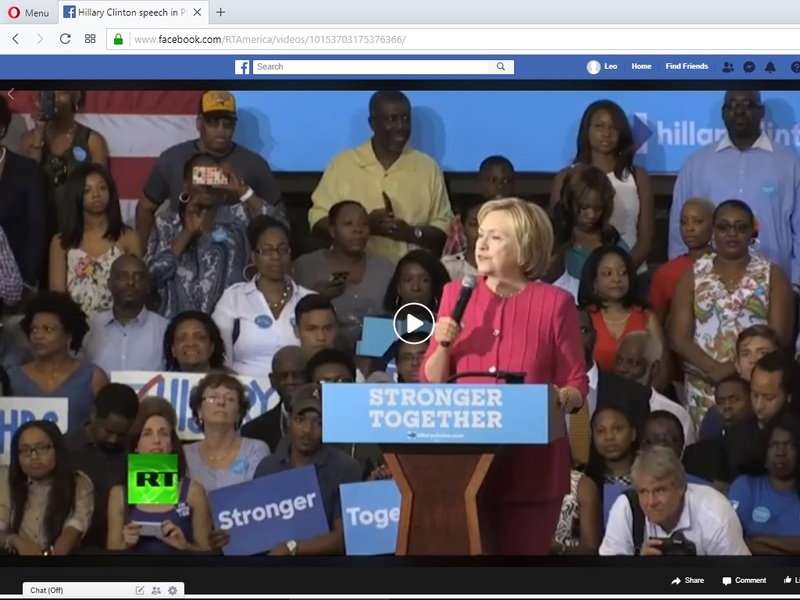 A broad assault on the energy industry — to “disrupt Florida and other U.S. energy pipelines” and to “disrupt the booming American energy industry” — has been conducted by Obama, Hillary, and the Democratic Party since 2010. A “Russian connection” has been acknowledged by some small MSM outlets only recently. Initially published on 09/17, but most material was added on 10/04. How many Lies can one New York Times Article Contain?